Business spreadsheet software is one of the most popular software for data manipulation. They are widely used and welcomed by business users with their superior advantages on the flexibility for data processing and presenting as well as reporting functions. Especially, business spreadsheet tools are easy to use and can visualize data computing and analysis, which greatly increase convenience and efficiency for business users without high technical background. At the same time, the disadvantages of business spreadsheet software causes business users to be red faced. For instance, spreadsheets are vulnerable to alter, which means it’s easy to change the formulas or values and anyone can steal your achievements (It’s easy to copy and paste.) Besides, it takes a long time to figure out what formula should be used if users are not familiar with spreadsheets. Someone also complain that things get worse if the spreadsheets are in the hands of non-IT personnel who don’t know about storage and backup. There are even more shocking errors brought about by common business spreadsheet software if you Google up “spreadsheets horror stories”. In this case, is it time to move on to better alternatives or stay on business spreadsheet software? Let’s dive into these disadvantages of business spreadsheet software. Referring the vulnerability for alteration, this is no longer a problem as users can protect the sheet or workbook. Some business spreadsheet software like esCalc allows business users to set different password for full control, editing, fill in and view. In order to avoid misinput, users can set validation. When it comes to formula, the biggest problem is that it’s really difficult to remember and understand a long and complicated formula. But if users know about macros or have VBA skills, they don’t need to remember formula. They can also resort to the business spreadsheet software which allow them to conduct complex computing easily with menu or function operation like esCalc. For backup problem, spreadsheet software like esCalc automatically creates a backup file added to the original one. As for the errors mentioned in “spreadsheets horror stories”, it’s definitely not the fault of business spreadsheet software. How can we attribute a keystroke error to the spreadsheet calculating? It’s unfair to blame a tool because of human error or misusage. The benefit of the business spreadsheet tool lies in the proper usage. Some users complain that business spreadsheet software are not suited to store large amounts of information or manage it as effectively as a database. This is true because spreadsheets are not databases, which decides that they cannot have all the functions of databases. Could you blame the databases for couldn’t presenting data like spreadsheet software? This is just like the criticism to Excel’s weakness on statistical computing and analysis. 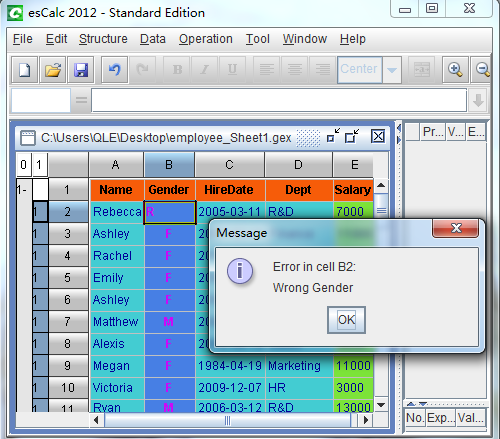 You should never expect Excel to act like a professional statistical computing and analysis software. Excel is not developed for that purpose. Never forget Gartner Group’s conclusion: “Enterprises should advise their scientists and professional statisticians not to use Microsoft Excel for substantive statistical analysis. 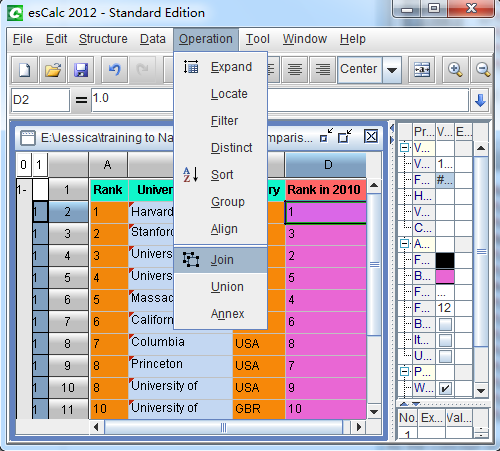 Instead, enterprises should look for professional statistical analysis software certified to pass the (NIST) Statistical Reference Datasets tests to their users’ required level of accuracy.” If you want to use spreadsheet for such kind of computing and analysis, esCalc, the Excel alternative is a better choice. It is created for complementing the disadvantages of common business spreadsheet on complex computing ability.